Petroleum, or crude oil, is one of the most valuable commodities traded in the world. It accounts for slightly more than one-third of the world's energy supply and is of vital importance to many industries and nations. Petroleum is a naturally occurring, black, sticky liquid that may be refined into gasoline, diesel fuel, kerosene, jet fuel, motor oil, asphalt, paraffin wax, and many other products. Although the price of crude oil is traditionally high, it fluctuates daily and in response to a variety of factors; these include supply and demand, the world economy, environmental issues, and wars or other developments in countries that buy or produce oil. Three oilfields are producing crude oil in Newfoundland and Labrador offshore areas as of 2008 - Hibernia, Terra Nova, and White Rose. A fourth field, Hebron, is set to produce first oil in 2017. Photographer unknown. Courtesy of Petro-Canada. Newfoundland and Labrador's offshore oil industry has made significant contributions to the provincial economy in recent decades. It creates jobs, adds to provincial revenues, helps to curb outmigration, stimulates consumer spending, and indirectly benefits other sectors of the economy, including real estate, education and research, manufacturing, and retail. As of 2008, three oilfields are producing crude oil in provincial offshore areas - Hibernia, Terra Nova, and White Rose. A fourth field, Hebron, is set to produce first oil in 2017. Exploratory drilling indicates additional oil deposits exist in Newfoundland and Labrador offshore waters that may also hold commercial potential. 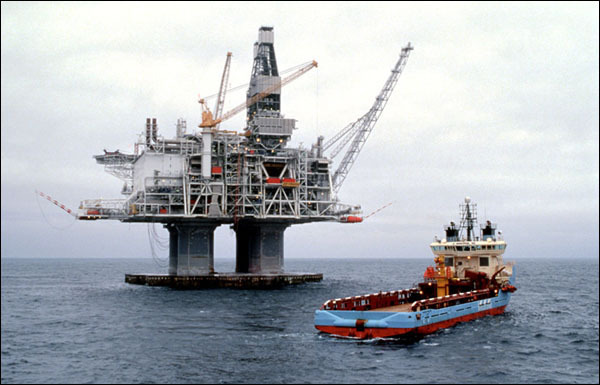 Oil workers discovered Newfoundland and Labrador's first commercial offshore oilfield in 1979 after about 13 years of exploratory drilling in offshore waters. Known as Hibernia, the oilfield is located on the Grand Banks in the Jeanne d'Arc Basin, about 315 km east of St. John's. 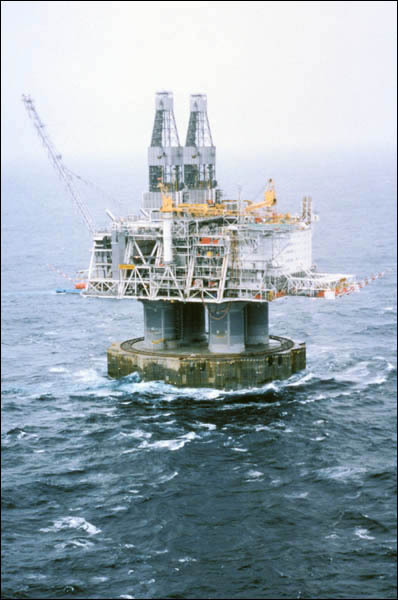 Construction of the Hibernia platform and other oil-extraction structures began in 1990 and the development produced its first barrel of oil in 1997. Industry and government officials estimate the oilfield holds about 884 million barrels of retrievable oil, making it the province's largest producing field to date. Terra Nova Development Key Components, n.d. The Terra Nova oilfield is located on the Grand Banks in the Jeanne d'Arc Basin. It began operating in 2002 and is estimated to hold 354 million barrels of recoverable oil. Artist unknown. Courtesy of Petro-Canada. Three other oilfields were discovered in the Jeanne d'Arc Basin during the 1980s: Terra Nova, White Rose, and Hebron. The Terra Nova oilfield began operating in 2002 and is estimated to hold 354 million barrels of recoverable oil, while White Rose entered production in 2005 and holds approximately 286 million barrels of oil. The final field, Hebron, is scheduled to begin production in 2017, and construction work for the project began in 2012. Officials estimate Hebron holds about 700 million barrels of oil, making it the second largest known commercial oilfield in Newfoundland and Labrador. Because the province's oil reserves are non-renewable, each oilfield will produce for a finite amount of time. Hebron is estimated to produce oil for 25 years, Hibernia for 20, White Rose for 15, and Terra Nova for 10. 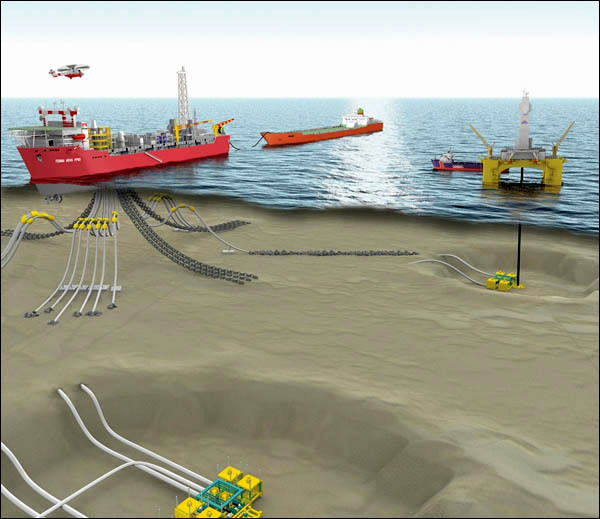 However, Husky Oil, Petro-Canada, and other petroleum companies are exploring other offshore sites for undiscovered oil reserves. Of particular interest are the Grand Banks, the Labrador shelf, and areas off Newfoundland's west and south coasts. Although the oil and gas industry has not existed in Newfoundland and Labrador for very long, it is a key component of the provincial economy. From 1997 through 2007, Hibernia, Terra Nova, and White Rose produced 867 million barrels of crude oil, worth about $46 billion. The industry accounted for 35 per cent of the provincial GDP in 2007, up from 13 per cent in 1999 and 24.3 per cent in 2004. According to Statistics Canada, Newfoundland and Labrador experienced greater economic growth in 2007 than any other Canadian province, largely due to its oil and mining industries. The White Rose Production, Storage, and Offloading Vessel, n.d.
From 1997 through 2007, Newfoundland and Labrador's three oilfields - Hibernia, Terra Nova, and White Rose - have produced 867 million barrels of crude oil, worth about $46 billion. The oil and gas sector directly employed about 2,851 workers in 2007, which accounted for 1.3 per cent of the province's labour force. 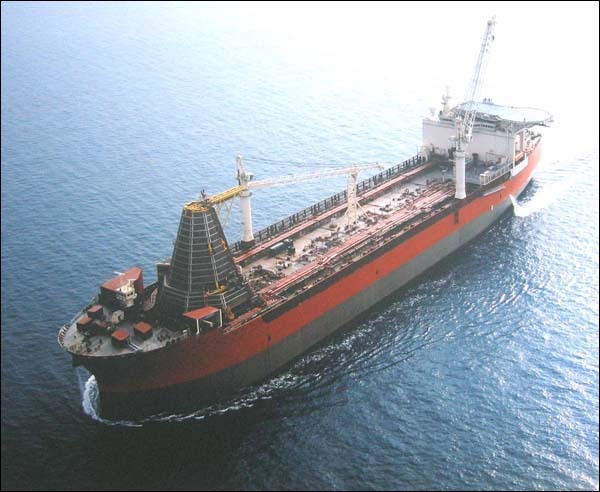 As of 31 March 2008, between 88 and 94 per cent of all workers at Hibernia, Terra Nova, and White Rose were residents of Newfoundland and Labrador, while almost all - between 95 and 99 per cent - were Canadian. Short-term construction work leading up to oil production also provides much employment for local workers. At Bull Arm, Trinity Bay, for example, about 5,800 labourers helped to build infrastructure associated with the Hibernia development from 1990 to 1997. In addition, the oil and gas sector creates many spin-off jobs for workers in other industries and businesses, and indirectly employed 3.8 per cent of the provincial workforce in 2007. With greater employment comes increased spending, which benefits other sectors of the economy. The oil industry accounted for the construction of 119 homes in 2004 and $370 million in retail sales, which provided employment for architects, construction workers, salespeople, and many other workers. An associated rise in income, property, and sales taxes also added to federal, provincial, and municipal revenues. The oil industry is one of the most profitable on Earth, but it is not risk free. Oil prices vary daily and depend on a variety of factors over which individual governments and industry have limited to no control. These include worldwide rates of consumption and production, the overall health of the global economy, and sociopolitical developments in nations that buy or sell petroleum and its products. Global fuel consumption has increased in recent decades, due in part to population growth, increased urbanization, and the rapid economic development of populous countries like China and India. As more people live in industrialized urban centres, energy consumption increases alongside the demand for petroleum products. Since the mid-1990s, the world's demand for crude oil has steadily climbed from about 60 million barrels per day to 88 million barrels per day in 2008. Hibernia is Newfoundland and Labrador's largest producing oilfield to date. Industry and government officials estimate it holds about 884 million barrels of retrievable oil. If the demand for oil becomes greater than the industry's ability to supply it, then prices will likely rise sharply. This occurred at the start of the 21st century, when above-average global economic growth created a surge in energy demands. The price of crude oil more than doubled from $11.11 per barrel at the start of 1999 to $25.66 per barrel at the end 2000. In the coming years, hurricane-related supply disruptions, a weakening American dollar, war in Iraq (which decreased that oil-rich country's production rate), industrialization, population growth, rising fuel demands in emerging economies, and other factors caused oil prices to climb steadily higher, until they reached a record-setting $147.27 per barrel on 11 July 2008. However, the situation reversed in the coming months, as the world entered a financial crisis and crude prices tumbled. This was in large part due to the collapse of the American mortgage market in September 2008, which led to significant stock markets losses around the world and forced several large financial institutions in the United States and Europe to collapse or receive government monies to remain solvent. By the end of November, the Unites States, Japan, and many European countries had entered into a recession, while Canada announced it may also be headed for a recession in 2009. A country is in recession if it experiences negative economic growth for a period of six months or longer. Unemployment and the threat of unemployment became increasingly widespread in late 2008 as industries around the world struggled to remain profitable in a weakening and unstable economy. With less money to spend, individuals, industries, and countries may continue to buy less oil, causing global fuel consumption to decrease. Concerns in the marketplace that the oil industry may produce more petroleum than it can sell have pushed prices down significantly. Light crude dropped to $43.93 a barrel on 4 December 2008 and industry officials expected it to continue falling as demand fell in oil-consuming regions. Dropping prices can negatively affect the Newfoundland and Labrador oil industry by cutting into profits and discouraging oil companies from investing in new projects. In August 2008, the provincial government forecast a profit of approximately $20 billion from the Hebron project, but based its estimate on oil prices of approximately $87 per barrel. Prices stood at almost double that amount in July 2008, but dropped to about half that amount in December of the same year. Hebron will not begin producing until 2017, at which time prices may have rebounded, but they may also remain low. Although the oil industry is traditionally quite lucrative, it depends on the international marketplace and is therefore subject to numerous risks and uncertainties. Article by Jenny Higgins. ©2009, Newfoundland and Labrador Heritage Web Site. For other related articles view the Industrialization section of the Economy Table of Contents.